UL Business Leader & Commercial Director, EMEA APAC at UL EHS Sustainability, Grant French, along with UL Taiwan Region CEO Tsung-Hung Chen, UL Corporate Environment and Sustainability Manager Ellen Shieh, and UL Business Development Manager Yi-Lin Sang, visited the Taiwan Institute for Sustainable Energy (TAISE) on March 21, with TAISE Chairman Eugene Chien personally receiving the delegation, to not only introduce the results of the Alliance for Sustainable Development Goals (A･SDGs), and the successful hosting of the first Global Corporate Sustainability Forum (GCSF) in November 2018 with over 2,100 participants attending. Ambassador Chien also shared about Taiwan’s progress in promoting environmental protection, including recycling technologies. Ambassador Chien also noted that the Bloomberg evaluations show that Taiwan companies are first in Asia for corporate transparency, and seventh worldwide, and among the Dow Jones Sustainability Index (DJSI) Taiwan ranks eleventh in the DJSI World Index, and first in the DJSI Emerging Market Index. 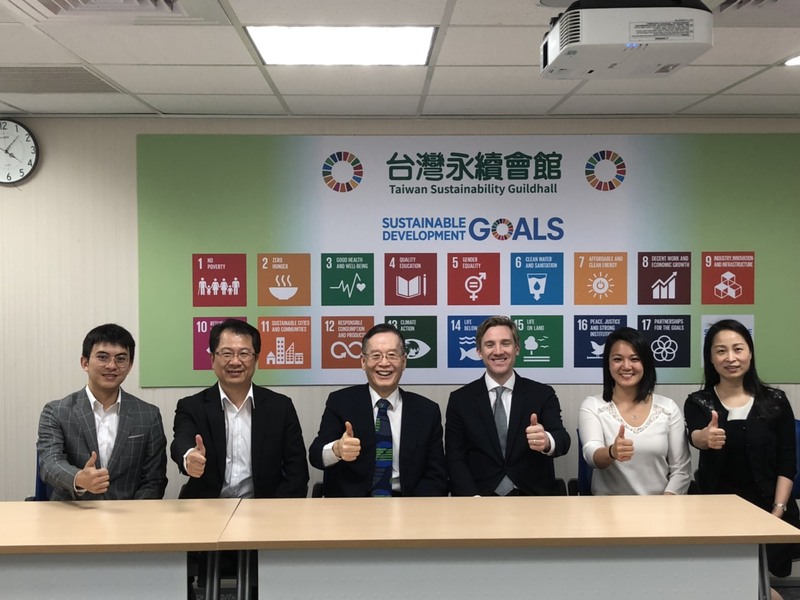 These exemplary results demonstrate the sound successes of Taiwan in promoting sustainable development. Photo (from left standing in the front row): Taiwan Center for Corporate Sustainability Manager Chun-Yeh Lung, UL Taiwan Region CEO Tsung-Hung Chen, Taiwan Institute for Sustainable Energy Chairman Ambassador Eugene Chien, UL Business Leader & Commercial Director, EMEA APAC at UL EHS Sustainability, Grant French, UL Corporate Environment and Sustainability Manager Ellen Shieh, and UL Business Development Manager Yi-Lin Sang.